When I have visitors in town, they often ask me what to expect when visiting Hanauma Bay — BESIDES the beautiful scenery. What they’re really asking is — what kind of cool marine life can I see if I go snorkeling there and where exactly might I find them? 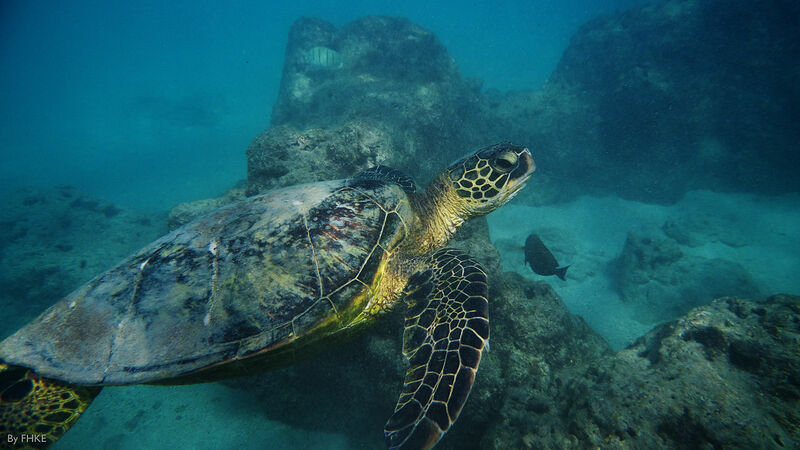 In Hanauma Bay, the turtles remain in the shallow water near the reefs. They are very comfortable around people and will swim alongside snorkelers. Even if a turtle approaches you, give it plenty of room to swim and surface for air. State law makes it illegal to touch the turtles. Look for signs of annoyance while you are swimming with the honu. If you get too close, the turtles will warn you by making a “yawning” type motion with their mouth. When they are very irritated, you will see a “flipper swipe” over the forehead. This is the turtle’s way of telling you to back off. Triggerfish are on the move constantly. While you are snorkeling, you will see them moving alone or in small groups around the reef. They do not slow down until nighttime when they use their lower spike to “trigger” into the sand for rest. They stick to the shallower areas of coral reef. They are somewhat territorial fish, and will defend a certain hiding place from intruders. Keep this in mind when you are snorkeling so you can be wary of leaving their hiding places alone. They travel in small schools and stick close together. Surgeonfish are herbivores and reside in the shallow waters of the coral reef. They feed on algae, so look for them near rocks that get a lot of filtered sunlight. Depending on the variety of surgeonfish, you will find them grazing alone or in small groups. They do not typically form large schools but stick to small groupings. Snorkeling is a relatively safe activity, but moray eels are one of the few threats to your snorkeling adventure. Moray eels will attack humans if they are disturbed and provoked. Their teeth are very sharp and can injure your fingers or limbs quite seriously. Since moray eels reside in rocky areas, make sure to keep your hands and fingers out of crevices and holes. If you must investigate a rocky area, do so with a stick or a probe. However, moray eels rarely harm snorkelers. If you do see a moray eel, do not be surprised to see its mouth opening and closing. While this may see intimidating, they are only breathing. If they are left alone, they will keep to themselves. They are normally night stalkers and stay hidden during the day. Consider yourself lucky if you happen to see their protruding jaw sticking out from a rock or crevice. Hanauma Bay remains one of the best places for visitors to view rare and endargered sea turtles in their natural environment. You’ll find Milletseed Butterfly fish traveling in schools. They feed on the coral polyps in the reef and the sea anemones. While snorkeling at Hanauma Bay, you will see them darting in and out of the coral formations and looking for their next meal. They stick primarily to shallower waters, under 18 meters, so the bay is the perfect place to find them. Milletseed Butterfly fish also tend to stick to one “home range.” That’s why you’ll find so many in the bay. They prefer to keep to one area where they know there is a food supply, rather than swimming elsewhere. Butterfly fish are diurnal, meaning that they are most active during the day. Daytime snorkelers will have no problem finding active schools of these fish. Toward dusk, the fish will settle in reef recesses and become inactive for the night. Parrotfish are very active during the day and stay in the shallower waters of the bay. At night they rest in crevices and some varieties excrete a thick coat of mucus to protect them. If you are snorkeling in the early morning hours or toward dusk you may see some of this mucus in the crevices of rocks and coral formation. Depending on the time you visit Hanauma Bay you’ll either see goatfish in large schools with other schooling fish, or combing the ocean floor individually. 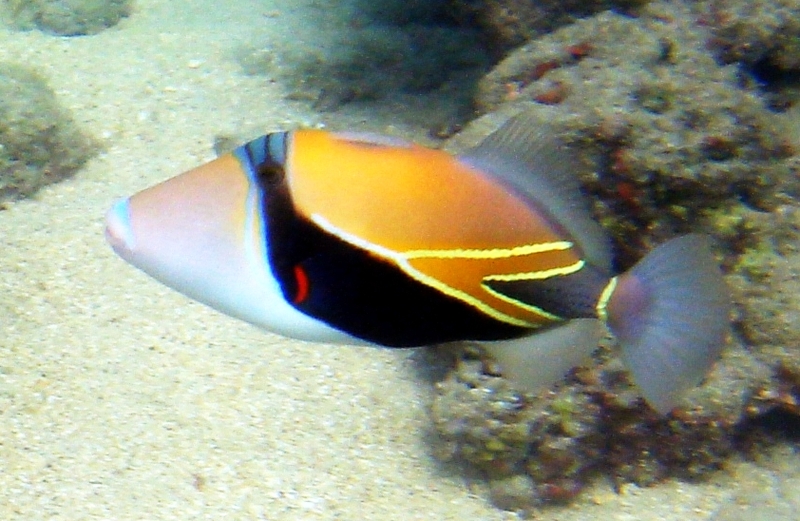 The Reef Triggerfish, or Humuhumunukunukuapua'a is the official State Fish of Hawaii and can be found in abundance at Hanauma Bay. Be aware that Box Jellyfish are usually most plentiful at Hanauma Bay 9-10 days after the full moon. If you encounter a jellyfish and are stung, you may feel a stinging, burning sensation, redness in the affected areas and swelling of lymph nodes. Long red welt lines may appear where the tentacles touched your skin. If you are stung, the lifeguard on duty can help with first aid. However, the best remedy is prevention. If you see jellyfish while you are snorkeling, steer clear of the area. Also, make sure to stay far away from any dead jellyfish on the beach. Their tentacles continue to sting long after they are dead. Keep in mind Box Jellyfish are common on all the South Shores of the islands, so you’ll also need to be aware if you’re taking surfing or paddle-boarding lessons in Waikiki. Sea urchins are a minor threat while snorkeling. The most dangerous urchins have thin needle-like spines that are venomous. However, all urchins can injure your feet if you step on them. Protect yourself while snorkeling by following a simple set of precautions. Wear water shoes or flippers during your snorkeling at Hanauma bay. Do not stand directly on any rocky surface or coral. If you must stand, inspect the area before you place your foot down. If you do become injured by a venomous sea urchin, a lifeguard on duty can help with first aid. However, with proper precautions while you are snorkeling, you shouldn’t have to worry about sea urchin injuries. Marine life at Hanauma Bay consists of some of the most beautiful animals you’ll encounter while on your vacation in Hawaii. And, you’ll want to know all you can about them, so you can fully enjoy them! So, take-along this “cheat-sheet” next time you visit Hanauma Bay!